Last book buys of the year. Honest. I just couldn’t help it, it’s been snowing (which is lovely) and freezing (which isn’t) and to cheer myself up on a cold afternoon I popped into two charity shops and bagged myself some books. 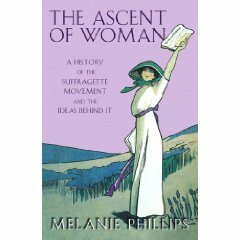 The Ascent of Woman: A History of the Suffragette Movement and the Ideas Behind It by Melanie Phillips – need I say more? I just couldn’t resist! The Diary of a Provincial Lady by E.M. Delafield – this has been all over the book blogosphere so I think it was fate when I set eyes on this Virago Modern Classics edition. Dancing with Mr. Darcy – a collection of original short stories inspired by Jane Austen and commissioned by Chawton House Library and introduced by Sarah Waters. I must say, I like the selection in the Oxfam bookshop in Kentish Town. Less pricey than some of the Oxfam bookshops in more upmarket areas and with an interesting collection. I’m going to try and finish my current reads before the new year so that I can start reading for my various challenges. I also received a gift card for my birthday and will be debating with myself on which books to purchase in the new year. Looking good! What a great set of books. I can particularly recommend Dancing With Mr Darcy – I finished it last weekend. Ha ha, I’m trying to stay out of shops, although internet shopping really makes it hard. I think I have a bit of will power left somewhere. Looking forward to Viggo Mortensen erm… The Road (movie) as well! I read the book last year (which is 2008 ;)) and I remember it vividly. i didn’t know that Drabble and Byatt were sisters!!! My holidays have just started yesterday…i can see that they will fly really fast, visiting relatives and family friends. telling myself that i have to make sure i get some TIME for MY OWN to relax, and the best way i can think of now is to take a book i enjoy. congrats for your blog in 2009, and happy blogging in 2010! Thanks Eriko, your comments are always enlightening and encouraging. Enjoy your holidays and happy reading! Are you planning on doing a review of any of your last reads. Particularly interested in Diary of an ordinary woman and Diary of a Provincial Lady. What were your impressions on these two? I will as soon as I read them. I tend to buy and hoard my books for a while, reading different books depending on how I feel. But I’m going to try and be good and get through a lot of my tbr pile this year, so watch this space! I’ve been rather slow with my reading since the holidays so am hoping to pick up pace and get some proper reading time in.